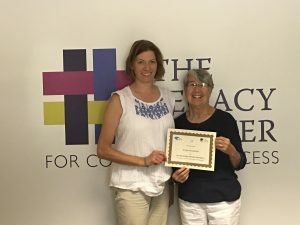 In celebration of World Literacy Day, September 8th, The Legacy Center held a Kindle Prize Giveaway Event for learners and tutors. The Kindle products were donated by CPI Fluid Engineering, a local division of the Lubrizol Corporation, in memory of their employee, Nicholas J. Sperry. Participants were asked to submit a statement describing what they liked best about tutoring with The Legacy Center. Several tutors and learners participated in the random drawing. Cindy Bozkaya, an English as a Second Language learner, won a Kindle Paperwhite. 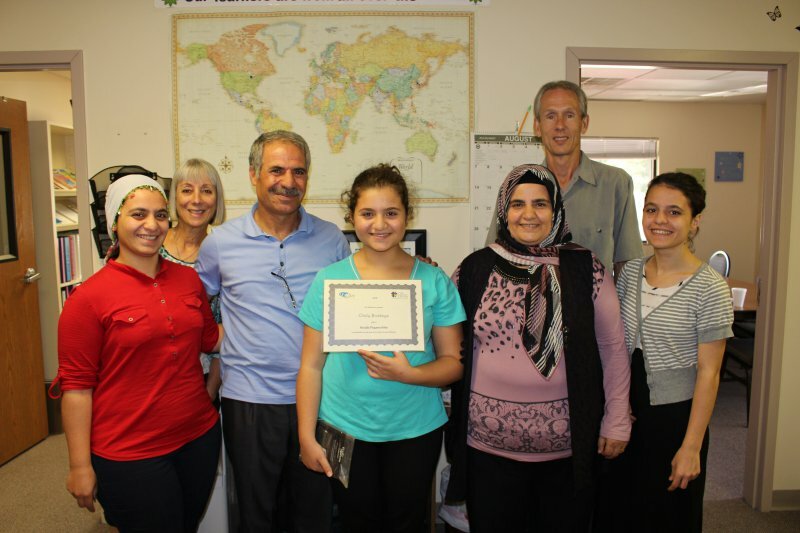 She said the staff and volunteer tutors have helped her improve her English fluency and math skills, which has helped her make progress in school. Dawson Willis, a Barton Reading and Spelling learner, won a Kindle FIRE Kid’s Edition. He said that his tutor is helping him learn to read, he’s having fun and he can now read by himself! 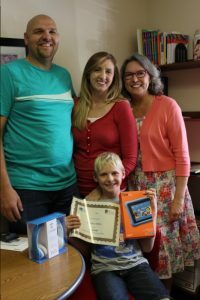 Aimee Kopiwada, who has been a volunteer tutor for nearly eight years, won a two-year subscription to Kindle Unlimited. When asked about what she likes best, she said it warms her heart to see a young person, who has been struggling to read, begin to relax and enjoy reading. The Legacy Center turns the dream of being able to read and understand language into a reality for adults and children alike. We provide free and confidential tutoring in reading, spelling, math and English as a Second Language so that people of all ages can reach their full potential. Call us today at (989) 496-1425 to learn more about our programs or how to become a volunteer tutor. Cindy Bozkaya (center), with tutors Kathleen Kinnish (second from left) and Peter Doty (second from right), and members of her family. Dawson Willis (front center), with his tutor Carolee Hinterman (right), and his parents. Aimee Kopiwada (right) with Kristi Kline, The Legacy Center’s Director of Student Reading Programs.